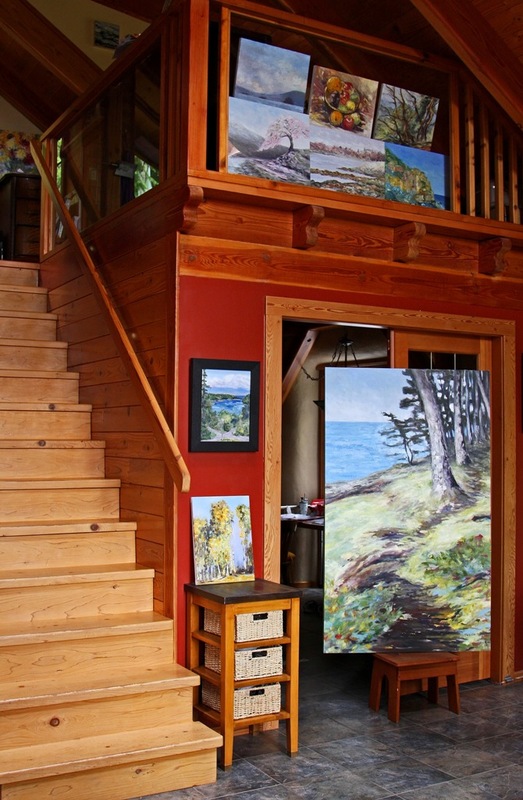 la casa de inspiracion hosts Creative Potager and is the home studio gallery of artist, and photographer and writer Terrill Welch. 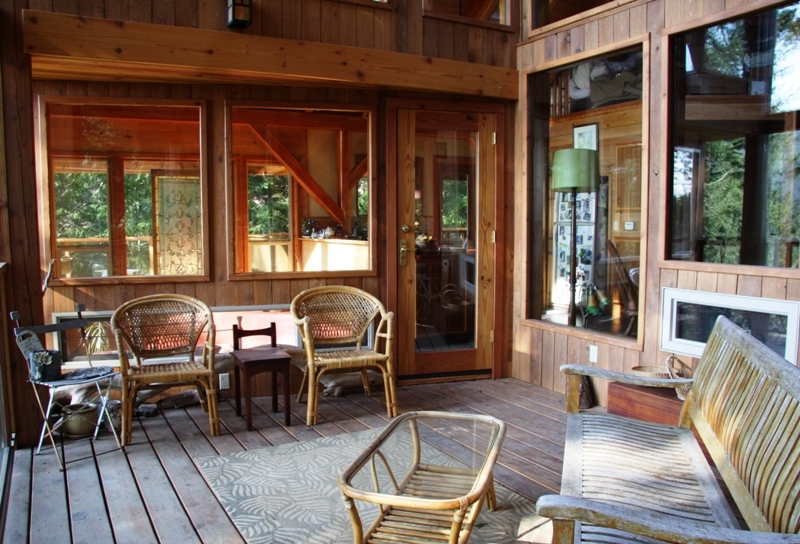 A warm, charismatic eco-friendly, timberframe and strawbale home la casa de inspiracion is a work of art created by Tracey Calvert between 2003 and 2006. Many people ask about and come to visit la casa de inspiracion for her character and beauty but also because they have some connection through their own assistance in her building or through a friend. 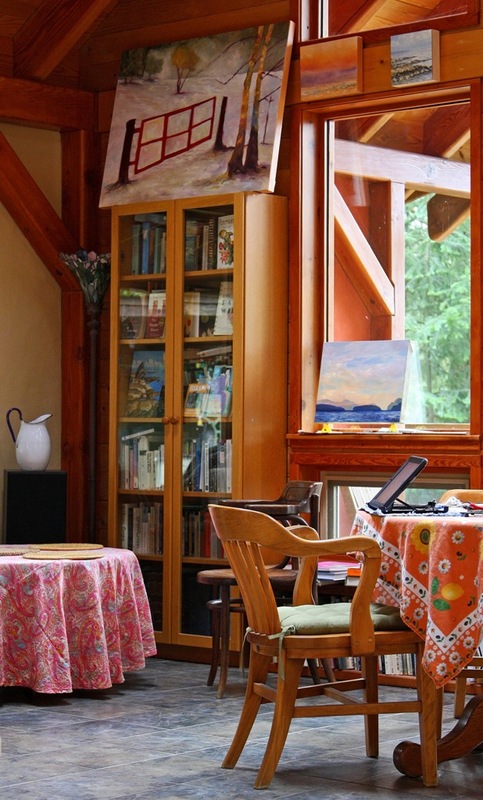 Terrill shares this incredible space with her husband David L. Colussi. David wrote the following poem Dwelling, which is in three parts. the human history of dwelling plays across the scene in drama or in documentary. Darkness dwells the way that we once did in wandering across the land. and west of the sun, where it follows as a hunter. and submerges all the valley into one big reservoir of night. Presently it rises up and silvers all the windows and the stained glass tears. This house of glass becomes a house of mirrors. 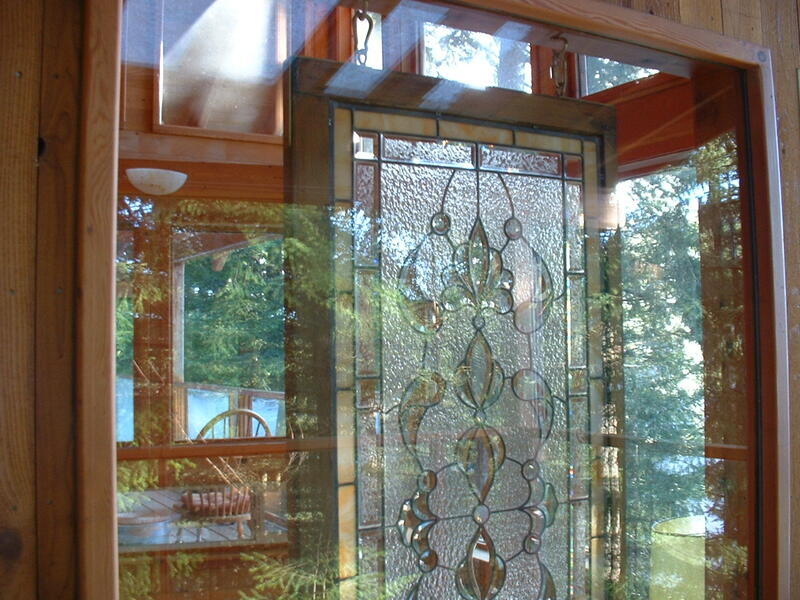 Now every light inside the house is captured in the window glass. Everything that we illuminate is gathered and sent back for us to dwell on and elucidate. The corner window down the hall shows part of my face in profile. my hands are on the keyboard moving in some stopped-action like some marionettes. The corners of the windows in the room downstairs contain some pieces of me I forgot were even there beneath the table. because this house of glass has turned into a house of mirrors. I work away at putting all my pieces back together. And see myself in childhood and remember questions that I thought I’d answered years ago. They’re all still there waiting to present their supplementaries. I wonder how I managed to survive with all these pieces some are missing some still there. They fit together best when you are here. 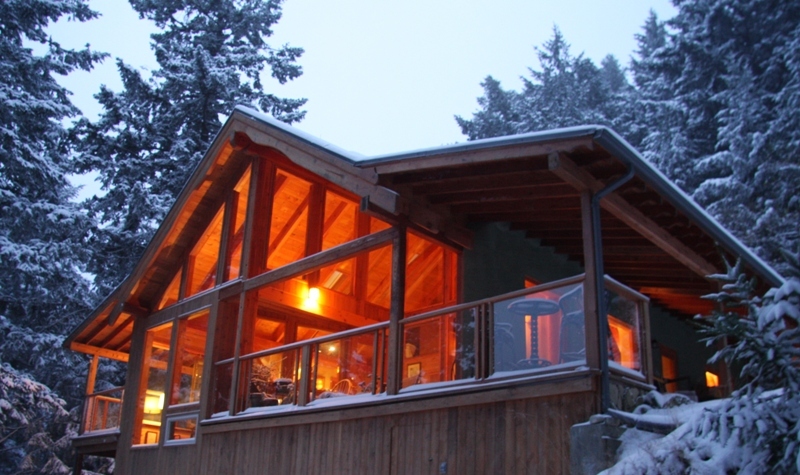 la casa de inspiracion is located on Mayne Island, in the southern gulf islands off the west coast of British Columbia, Canada. I opened up Twitter (on Solstice) to check my account. I usually go directly to my account. To many adds, not interested in “whatever” is being spewed in this moment. I saw your face, I clicked your page, I knew I had to know more about who you were and what you were up to, so I clicked your site and here I am. My DREAM for many years now, has been to move to Victoria, BC. I don’t know why I am so drawn to western Canada – perhaps because I see a retreat center there that I will ba a practicing part of – or. . . . I am a writer, photographer, painter and personal development/energy clearing and balancing specialist. I’ve been in the human potential development field for 30 years. I don’t know why I am teling you this. This is an auspicious day the winter Solstice 2010 and I do know that the connection I’ve made to you thru Twitter was not a ‘per chance’ kind of thing – rather more like a ‘soul clan’ meeting – precisely set for NOW! To fnd out more about me please visit my blog at http://www.lifebydesignwithalison.com or on facebook at http://www.facebook.com/lifebydesignwithalison or on twitter (and I am following you) at aliinspired. I really do think we should talk soon. What a beeeaaautiful dwelling indeed. Wowsa. It would be hard NOT to create there. Thank you Pea. I had a feeling you would like la casa de inspiracion. Glad you came by to visit. The words and images here are so beautiful. It wasn’t until I set to comment did I see the wonder of your background. This is so meaningful. How is it that you can see as it was so intended?! Thank you. Sometimes I miss it even when I live here Tina… it is the strangest thing really. What a beautiful home! So like your artwork, and your meditaions on nature. Glad to hear it Deborah and I look forward to further connections in the future. Beautiful home. 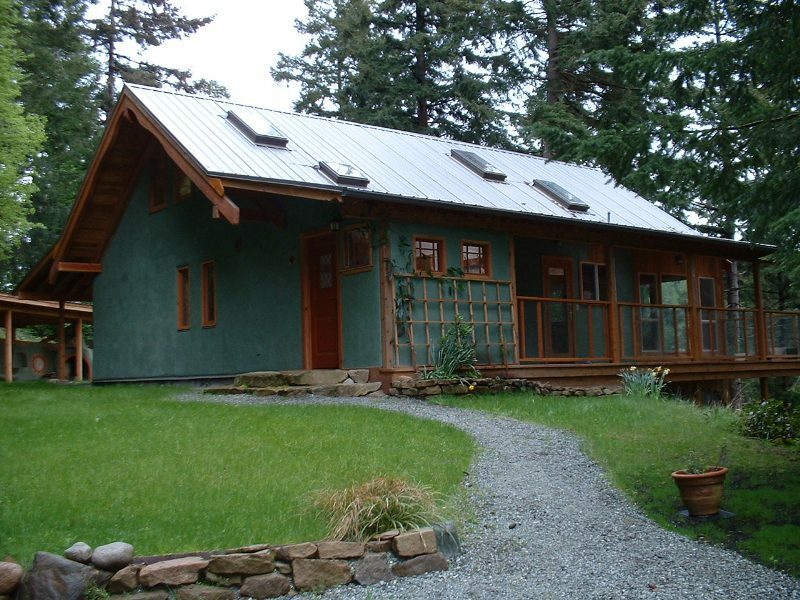 My husband and I have always been interested in strawbale homes, we even drove down to Arizona to look at one to buy (but eneded up buying in the Gulf Islands…long story). It looks like it has a wonderful warm and peaceful vibe. Thank you for sharing. Your are most welcome Deb. The woman who built our house Had a wonderful eye for light and detail. I believe she is still living on Pender Island and recently finished building a strawbale workshop.